ADDY 2014 Series: Perspectives in Manufacturing | Frank. Frank. has been fortunate enough to work with SME (The Society of Manufacturing Engineers, a non-profit association promoting manufacturing for over 80 years) since 2010 and has helped market several of their national and international trade events. We feel fortunate because they recognize that high-end, high-concept, incredibly designed print and electronic pieces draw attention and serve to promote the brand that matches the stature of their events. This year, we have two Addy award-winning pieces for two SME events, AeroDef® Manufacturing Summit and Exposition and The BIG M Convergence. AeroDef Manufacturing Summit and Exposition is the leading trade event for the aerospace and defense manufacturing industry. Produced in partnership with industry OEMs (Original Equipment Manufacturers) like Boeing, Lockheed Martin, Northrop Grumman, the event showcases the industry’s most advanced technologies. Keynote speakers and panelists come from the highest level of government and business to share their vision of the potential of technology, collaboration and public policy to transform manufacturing—concepts that attendees can actually experience on the exposition floor and in-depth technical sessions. It’s the one event that brings together high-concept, integrated solutions and real-world applications. 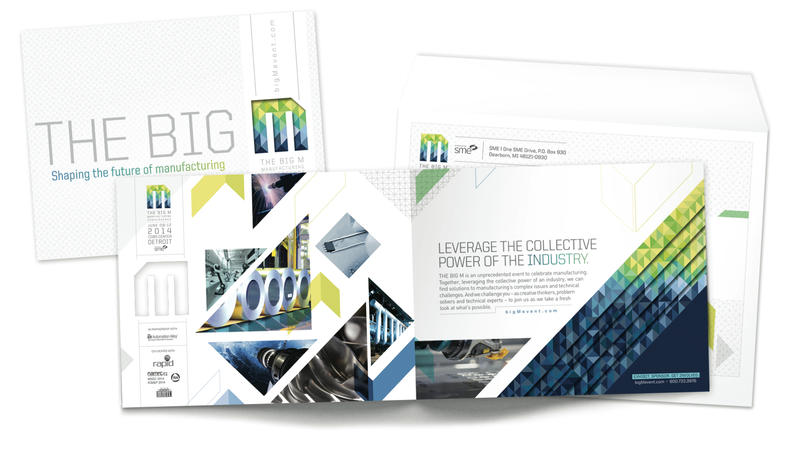 The BIG M Convergence puts the collective power of manufacturing to work for its attendees. It’s not only devoted to answering the big questions about the future of the manufacturing industry but also on the entire manufacturing process—from design to production to quality to sustainability, and much more. The BIG M is ultimately about helping its attendees find the solutions they need now. The Exhibitor Prospectus is the first piece to be developed for each event and it sets the tone and concept for the event’s campaign. It launches the cycle of the promotional marketing campaign and seeks to convince the target audience that our event is THE one at which they should exhibit. 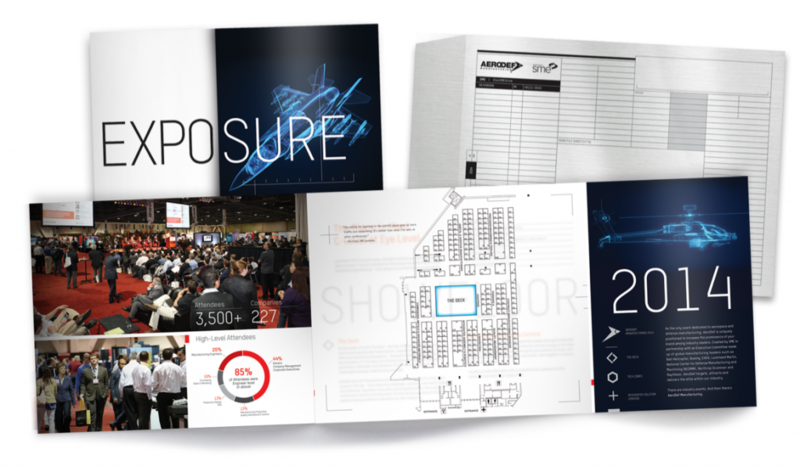 The AeroDef Exhibitor Prospectus was designed to be a stunning, oversized piece that incorporated high-end elements to match the grandeur of the event planned. The creative utilizes easily recognizable aerospace and defense technology in wireframes/x-rays to communicate that AeroDef will bring focus, clarity and insight into the aerospace and defense industries for attendees and exhibitors alike. AeroDef was held this year in Long Beach, CA at the end of February. As an inaugural show, we knew the one way to start the BIG M marketing was to do something BIG. The Exhibitor Prospectus featured several layers of die-cuts and additional graphic elements to build the logo prominently displayed on the cover. The copy reinforced the message for the audience that this event seeks to leverage the collective power of the manufacturing industry—an unprecedented collaborative effort to tackle the complex issues and technical challenges in the industry. We’ll know today if either has won Gold!